"Honoring the Past, Committing to the Future"
the prestige that came with the service. Thus the fire service was born. Members of the Vigiles Societas honor the past and pledge their commitment to the future of the fire service. Vigiles: A corps who were the fire brigade of ancient Rome nicknamed Spartoli, named because of the buckets they carried water in which were made of rope and sealed with pitch. They were strategically located throughout the area of Rome, becoming one of the earliest predecessors of the fire and emergency services.The Vigiles Societas is composed of a corps of men and women who are committed to the fire service and pledge to advance the educational knowledge of others in the fire service and the public. As a member of this distinguished group you will have the opportunity to impact the future of the fire service by helping fund the costs associated with the educational opportunities available at all conferences organized by the Florida Fire & Emergency Services Foundation. Your contribution will help fund the costs associated with scholarships for members of the fire service to attend conferences, to pay for travel costs incurred by instructors and key note speakers, producing educational materials, and pay for the cost of equipment needed for presentations. Joining the Ranks of the Vigiles Societas: To join the ranks of the Vigiles Societas you need to pledge your support to advance the educational knowledge of others in the fire service and to improve the public’s awareness by committing to one of the Roman Firefighter position or consider paying for a Roman Scholar Package which would allow a member to attend one or all of the conferences listed below. Uncinarius - The firefighter who was a “hook” man, who carried a large fire hook for pulling off burning roofs. With your $250 donation you will receive a Vigiles Societas lapel pin. Siphonarius - The firefighter who was responsible for the supervision and operation of the water pumps. This level is achieved with a $500 donation.With your $500 donation you will receive a Vigiles Societas lapel pin. Aquarius - The firefighter whose main duties were the supply of water to the siphos or pumps and the organization of “bucket chains”. This level is achieved with a $750 dollar donation With your $750 donation you will receive a Vigiles Societas lapel pin. Praefectus Vigilum - The first documented group to command the first firefighters. Thus, being the first recorded Fire Chief. With your $1000 donation you will receive a Vigiles Societas lapel pin encrusted with a ruby. silver fire ax lapel pin. Individuals that chose to join at the Uncinarius, Siphonarius, and Aquarius levels will be recognized with Vigiles Societas lapel pin. Only one lapel pin will be provided for members joining or upgrading within these three levels. Individuals joining or upgrading to the Praefectus Vigilum will receive a Vigiles Soietas lapel pin encrusted with a ruby. Individuals joining or upgrading to the Emperor level will receive a sterling silver fire axe lapel pin. The Florida Fire and Emergency Services Foundation provides many educational opportunities to the fire service each year. The scholarships provided by the Foundation allow individuals to participate in the many educational opportunities they may not otherwise have access to. The Florida Fire and Emergency Services Foundation provides many educational opportunities to the fire service each year. The scholarships provided by the Foundation allow individuals to participate in the many educational opportunities they may not otherwise have access to. 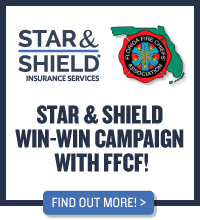 A Centurion Scholar Sponsor has the opportunity to help with educating many members of the Florida Fire Chiefs' Association. The Centurion was the most professional of the ranks and they were viewed as great leaders, well respected by those they led. They were held personally responsible for the training and conduct of those in their ranks, and inscriptions have been found indicating that they may have had the title "centuro et campidoctor (Training Officer). By assuming the responsibility for training, those who sponsor scholarships have earned the rank of Centurion. With your commitment a scholarship will be reserved in your name for the conference you select. There is no limit to the number of scholarships you can sponsor. By sponsoring the scholarship you will be joining the ranks of the Vigiles Societas. Furthermore, your named scholarship will be posted on the FFCA/FFESF webpage, will be recognized in the Florida Fire Service publication, and will be listed with all conference material. Currently the Florida Fire and Emergency Services Foundation offers scholarships for Fire Rescue-East, the National Emergency Vehicle Technician Training Academy, the Emergency Services Leadership Institute, Executive Development Conference, and the Safety and Health Conference. Fire-Rescue East is the premier Fire/EMS/Emergency services exposition and educational conference organized by the Florida Fire and Emergency Services Foundation. Cost for one scholarship is $900. The National Emergency Vehicle Technician Training Academy provides training for vehicle technicians and fire department driver engineers and is the largest testing facility in the nation. Cost for one scholarship is $850. The Emergency Services Leadership Institute provides a curriculum consistent with upper level academic achievement and addresses issues that are either not prominent in other curricula or not structured in a manner that allows for an integrated learning experience. Cost for each course is $550. Cost for all six courses is $3,300. The Executive Development Conference focuses on the educational offerings toward the senior officer level by providing numerous classroom presentations and networking opportunities. Cost for one scholarship is $1,500. The Chief Craig Haun Memorial Executive Development Conference Scholarship offers Centurion Scholar Sponsors an opportunity to sponsor this new special Scholarship opportunity named in Chief Haun's memory. Part of Chief Haun's legacy was his community and Association involvement, commitment and leadership for this conference as well as serving as FFCA’s 41st President (1997-1998). The scholarship will include full registration and lodging to the Annual Executive Development Conference which provides numerous classroom presentations and networking opportunities. Cost for one scholarship is $1500. The Safety and Health Conference provides a forum for departments safety and health committees to come together to discuss the latest in safety training, research, and healthy lifestyles within the fire service. Cost for one scholarship is $500. (*These amounts can be gifted over time) *Advancement to subsequent levels available by a cumulative gift. "A COPY OF THE OFFICIAL REGISTRATION AND FINANCIAL INFORMATION MAY BE OBTAINED FROM THE DIVISION OF CONSUMER SERVICES BY CALLING TOLL-FREE 1-800-HELP-FLA (435-7352) WITHIN THE STATE OR VISITING WWW.HELPFLA.COM. REGISTRATION DOES NOT IMPLY ENDORSEMENT, APPROVAL, OR RECOMMENDATION BY THE STATE."